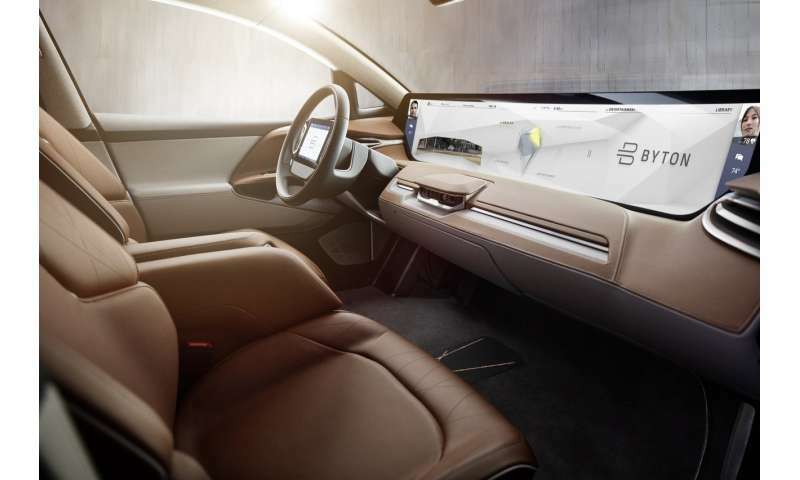 A Chinese startup unveiled its vision for the automobile of the future Sunday, promising to deliver an "intuitive and intelligent" car to global markets starting next year from around $45,000. The electric-powered concept car shown by Byton at the Consumer Electronics Show in Las Vegas is touted as a computing device on wheels, equipped with a "digital" lounge featuring a panoramic display acting as a hub for navigation, entertainment and even monitoring the health of its occupants. Backed by more than $200 million from investors including Chinese tech giant Tencent, Byton—whose name was chosen to suggest "bytes on wheels"—is among the latest entrants to a crowded field of startups and established players looking to emulate Tesla in the race for a new kind of vehicle which can be adapted for autonomous driving. "This is a product which is tailor-made for the future, which is autonomous and shared," said Daniel Kirchert, president and co-founder of the Nanjing-based startup. 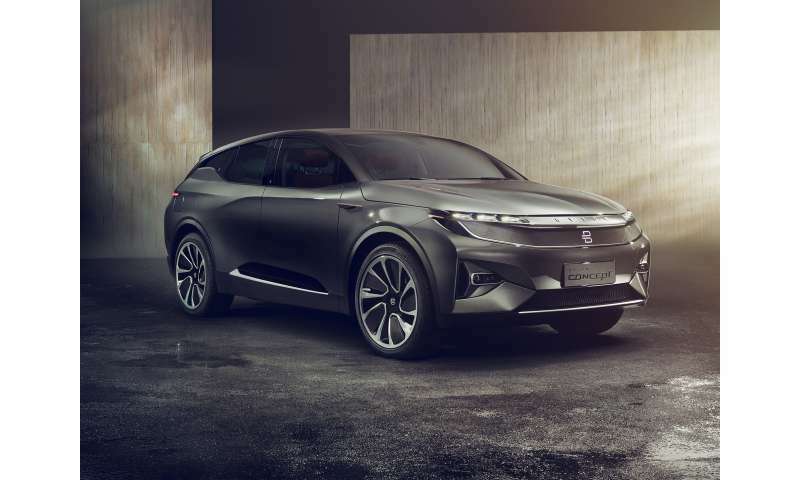 Byton, led by former executives from Tesla, BMW, Apple and Google, said it expects to launch in China by 2019 and in the United States and Europe by 2020. "This will be the most advanced vehicle in the market as of 2019," said chairman and chief executive Carsten Breitfeld, a former BMW executive, at a presentation in one of the first media events at the huge electronics show. The Byton car will use facial recognition to unlock and adapt to the driver and offer a range of other ways to interact including voice control with Amazon Alexa, touch and gesture. It will include 5G connectivity to the internet cloud and improve its functions with artificial intelligence. "It will improve your experience the more it knows you," said Kirchert. While other concept electric cars have been promoted at prices of $100,000 or more, the new Byton will face competition from the Tesla Model 3 and offerings from major automakers. Byton said the car will have a range of more than 500 kilometers (300 miles) before needing a recharge and will be able to "top up" its battery in 15 to 30 minutes. It will be offered with "level 3" autonomy which enables some functions without a driver and be capable of "level 4" for near-autonomous function from 2020, according to the company. It would be interesting if they can pull it off, and win market share in a crowded market, but the same concerns plaguing the current breed of electric cars will need to be addressed: safety, practically, internet security, actual range (as opposed to stated range) and cost.